VANCOUVER - Ty Long kicked a 34-yard field goal with 56 seconds left on the clock as the B.C. Lions picked up a wild 45-42 victory over the Winnipeg Blue Bombers on Friday night. The winning points were set up after Ronnie Yell intercepted Bombers quarterback Matt Nichols and returned the ball to the Winnipeg 35 with 1:21 left on the clock. After two running plays, Long - the rookie kicker who the Lions kept in favour of veteran Swayze Waters - split the uprights with his third field goal of the night at a raucous B.C. Place Stadium. Justin Medlock, who came up well short on a 61-yard field-goal attempt that would have won last November's West Division semifinal, didn't have enough leg from 50 yards with one second left on a boot that would have sent the game to overtime. 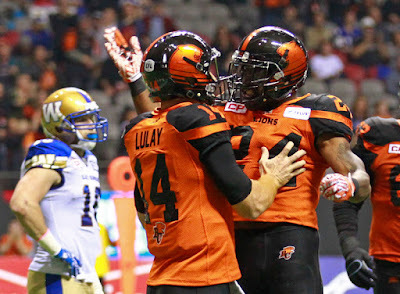 Travis Lulay passed for 404 yards and two TDs to Emmanuel Arceneaux to go along with two interceptions for B.C. (4-1). Jeremiah Johnson and Chris Rainey also scored touchdowns for the Lions. Nichols threw for 241 yards and three TDs, and scored another on the ground for Winnipeg (2-2), but also had that costly pick late. so much for O Shea being a Special Teams guru. This is shaping up to be be the best CFL football season in a generation!! And it all started with one of the most exciting Grey Cups ever last November. Yes, this years CFL has been 100x more exciting than last year, hands down. Hahaha Mike O'shea's arrogance and cockiness took them out of that game. 8 or lead and they try a fake on their own 30? What a buffoon.